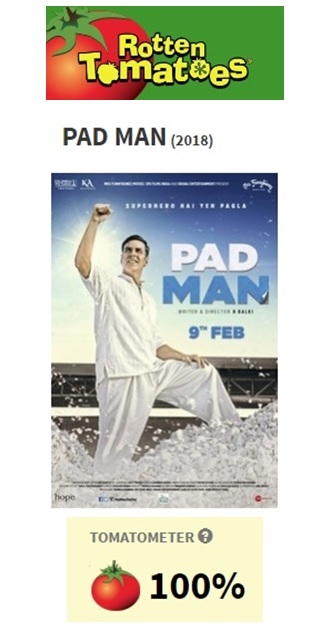 The hit and critically acclaimed film Pad Man starring Akshay Kumar, Radhika Apte and Sonam Kapoor and directed by R. Balki has just earned a very cool rating by the world’s critics. In fact, the film, which just released on February 9th, has just earned a outstanding 100% score on Rotten Tomatoes, the most trusted and respected movie site! This is very rare for any Indian film! According to the site, the Tomatometer rating is based on the published opinions of hundreds of film critics and it is a trusted measurement of movie and TV programming quality for millions of moviegoers. We here at BollySpice gave it an amazing 5 star rating and you can see more from critics on the Rotten Tomatoes site. Pad Man is the world’s first feature film on menstrual hygiene inspired by the story of TIME Magazine’s 100 Most Influential entrants Arunachalam Muruganantham, a rural welder from India with a unique, eccentrically mad edge who turned incredible inventor by providing women with access to high-quality and affordable sanitary pads 20 years ago. In case you missed them and to find out more be sure to check out our interviews with Akshay Kumar, Twinkle Khanna and even the music composer Amit Trivedi. Apparently the movie, along with Arunachalam Muruganantham are Superheroes!